Role play in any classroom brings a range of benefits. It adds variety to a lesson, which can be fun and motivating for students. It broadens the possibilities for language production by taking students beyond their own lives and experiences. Role play can also help with group dynamics; quieter students can take on the role of a much more forthright person and are encouraged to communicate more readily. Before you start a role play with your class, you need to be clear on what language skills you want them to develop. Is the role play designed to help them with the future tense, with question forms or with a certain vocabulary group? Are you trying to help them with set phrases used to negotiate or just with their fluency and ability to talk under pressure? Being clear in your aims for the role play will inform the preparation and follow up activities you choose to do. Assess the level and age of your class in order to prepare them effectively for the role play. A lower level class may need more initial input in identifying the language they’ll need for the role play. You could do preliminary activities where they practice the language in written form or through a reading task. It may be helpful to write key language (phrases or sentences they may use) up on the board as a reference. Higher level classes will need less initial input but they’ll still get more out of the activity if you can prepare them by describing the role play situation and getting them to suggest phrases and words that may be useful. Another way of helping students to learn language is by throwing them into a role play without any preparation whatsoever. In doing so, they recognize the specific language they lack for this particular situation. If you choose to do role plays in this way, it is important to continue the activity with a structured language finding section, followed by another, hopefully improved, attempt at the role play. Debate an issue – Split your class into two groups. Give each group an opposing point to debate and give them time to formulate their arguments. Information Gap – Divide your class into pairs. Both students are given a card containing missing information, so the two cards make a whole. They have to ask questions of their partner to fill in the gaps. 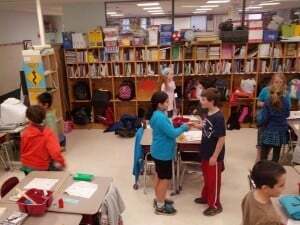 Conflict Situation – Putting your students in a role play conflict situation encourages them to use persuasive and conciliatory language. You could have them pretend to be an arguing neighbor or a complaining customer. Phone Call – Put your students into pairs and get them to sit back to back. This means they can’t rely on body language or gestures to aid understanding. Get them to “make a phone call” to book a hotel room or confirm an appointment. Group Planning – Divide your class into groups. Give them the task of brainstorming or planning something. It could be a party for a five year old or the design of a new tech product. Once finished, they can present their ideas to the rest of the class. To really cement the new or practiced language forms in the minds of your students, be sure to do some kind of follow up or reflective activity. Reflect on phrases used as well as facial expressions and body language as an extension of how they communicated their words. Role play is a great way to get students using and developing their language skills in a “real world” setting. With good planning, students are sure to gain confidence and language ability whilst having a little fun at the same time. With a background in Marketing, Jane Bolto currently works as a Content Specialist at Nybizdb.com. Always willing to share her insights.